Michael Rattray’s family owned and ran MalaMala Game Reserve, a private game reserve on the border of the Kruger National Park, for 52 years and his association with the National Park goes as far back as 1938. During this time, he watched with concern as the river levels dropped lower each year and the perennial Sand River assumed non-perennial status flowing intermittently during the dry winter months. This became the unfortunate state of affairs of most of the Kruger National Park’s rivers and it became vital that something be done to reverse this trend. The continual decline of “instream flows” impacted negatively on wildlife biodiversity in parks such as the Kruger National Park and the protection of these water resources became imperative to ensure the sustainability of the wildlife and therefore encourage an ongoing increase in tourism. The necessity to protect catchments is borne out of the fact that 80% of any river’s flow emanates from 20% of its most upstream area. In 1990 Michael Rattray exercised options on 8,000 hectares of land in the then Lydenberg district and the consolidation of these properties created Mount Anderson. At 2,000 metres above sea level in the river catchment areas of the Blyde River system of Mpumalanga, this development was the beginning of his contribution to serious water conservation – and the simultaneous protection of the indigenous Highveld flora and fauna. 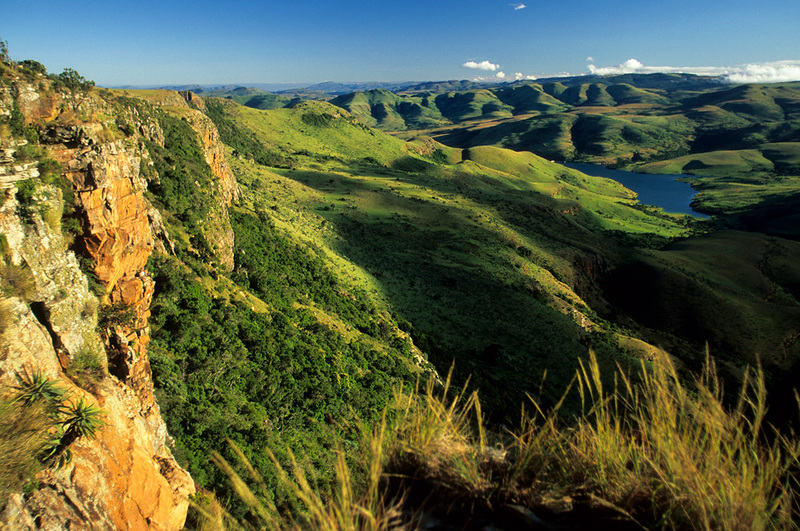 Mount Anderson derives its name from one of the highest peak in Mpumalanga, namely Mount Anderson, which at 2,000 metres, lies at the southern point of the property. Michael Rattray’s first action after this land acquisition was the removal of all exotic livestock. The use of these former summer grazing areas for sheep and cattle had denuded the flora, and in turn damaged the catchment areas of the five rivers that rise on the property. Overgrazing of the grass cover had seriously affected the water retaining sponges, but the simple removal of bulk indiscriminate grazers restored the rivers to produce a strong year round flow. Michael Rattray’s passion, and his vision and commitment for new forms of conservation, provided the motivation for acquiring the source of the rivers where some misinformed farmers were inflicting much of the damage. The Mount Anderson Water Catchment Reserve was formed and proclaimed in 1993. The process whereby the negative effects of overgrazing and inadequate road maintenance had caused soil erosion was immediately addressed, and within a short period the most severe thunderstorms had produced crystal clear water. A comprehensive exotic plant eradication program was also initiated which saw the removal of all plants and trees not indigenous to the area, including eucalyptus, wattle, and pine. A committee of neighboring landowners, all of whom have experienced the benefits of water conservation, constitutes the Mount Anderson Water Catchment Reserve, with Michael Rattray as the driving force behind its foundation. These properties are already a proclaimed nature reserve. Much of the revenue generated by this area is as a result of tourism, with the majority of income derived from fishing and associated industry. The Mount Anderson Catchment Nature Reserve employs the services of suitably qualified environmentally orientated scientists to assist in the management of the area as a single conservation unit. It is without doubt a unique contribution that Michael Rattray has made to water conservation. The rivers will now remain strong, providing valuable water downstream to irrigate the food crops so vitally necessary to feed the burgeoning population of South Africa. His concern for high altitude fauna and flora is also evident in his introduction to the conservancy, at his own expense, of those animals that are indigenous to the area. Since the transformation of this land into a conservancy, the previously overgrazed, palatable grasses are now in abundance and the quality of the savanna has fast returned to its former glory. Finally, such is the rate at which the rehabilitation progressed on Mount Anderson that many bird species have returned to the savannah. It is widely known that birds are an excellent and easily recognisable indication of the condition of the environment.